Using props to add visual interest to a speech is a common acceptable technique used by both novice and seasoned public speakers. That being said, props should never become the centrepiece of a talk, though they can absolutely be an excellent tool for keeping an audience engaged or highlighting a point. Below are some of the more frequently used props and how to work with them in the most effective manner possible. It’s customary for many speech makers to include overheads or slides into their talks. However, a good number of public speakers unintentionally misuse these props. Make certain that you do not rely on overheads or slide shows to give your presentation for you. Don’t read them word-for-word, don’t allow them to become the focal point, and don’t force them to make up for a poorly organised speech. Instead, use these props to add clarity to some element of your speech. For instance, overheads of statistical graphs can make an excellent supplement to a discussion.When handled correctly, they should be a speech’s “supporting player”, not the “star”. Many public speakers and lecturers wouldn’t consider handouts to be “props”; however, they should be treated thusly to keep them from overshadowing the speaker. Unfortunately, handouts are often a distraction to audience members rather than a helpful aid. If you want to provide your listeners with handouts, do so at the end of your speech rather than at the beginning. That way, there will be no shuffling of papers or heads buried in text while you’re trying to engage an audience’s attention. Should you decide to deliver handouts during the body of your speech, make certain they are short and that you give your listeners the opportunity to look them over. Pause during that time, then specifically tell your audience that you’re going to discuss what they just read on the handout. That way, everyone in the room will understand that the handout isn’t a substitute for your speech but a supplement to it. 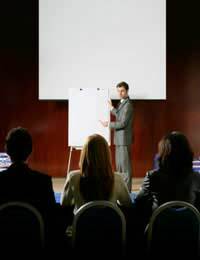 Many speakers who make speeches in smaller venues (such as corporate boardrooms or classrooms) have the opportunity to use chalkboards or white boards. Print all words in a large font. NOTE: These tools can become a “crutch” to even seasoned public speakers, so if you find yourself with your backside to the audience for more than a few seconds during your speech, curb your white board and chalkboard usage. Sometimes, it’s important or fun to hold up photos, magazines, or other smaller props to add credibility or interest to a topic. However, if you’re performing in a large venue, be wary of doing so, as the people in the back of the room will become frustrated because they cannot see your props. In smaller rooms, these types of props are perfectly acceptable, and in the case of an audience of 20-30 persons or less, passed around. There may be occasion to use a larger prop (such as the model of a building or even a vehicle) during your speech. Again, just make sure that it’s located in a place that a) doesn’t upstage you and b) can be seen by practically everyone in the room. Finally, if you’re planning on using living “props”, such as animals or children, remember that you’ll have to be ready to improv if necessary! Props that are alive are completely unpredictable—dogs get nervous and “mark” their territories, little kids become confused and start to wail—so be prepared for anything. (Bring wet wipes along with you, just in case! )In the end, it’s important to experiment when working with props. The right ones can add a certain degree of “oomph” to any presentation; just be sure that those you choose become part of your speech and do not take the place of your words.